This page is dedicated to one-heck-of an engineer, who has written extensively about his experiences in the ETO. I've had the opportunity to speak with him on the phone and to exchange numerous emails and letters, over the past few years. I wish to extend many thanks to Bill for taking the time to compile the following, and to share it with all of us. Your memoirs are priceless! June 14, 2012 - It is with deep regret and sadness, I inform you of the passing of my friend, Bill. Below are two letters I received from his sons. You will be truly missed. "Marion—I have talked of you with Dad and seen many of your communications with him. This morning I sent the attached to my law firm. Jeanelle, by the way, is my daughter, his granddaughter, of course, and she works for me as my paralegal. Believe it or not I have sent your web site to countless people who inquire of my dad, and today, one of my staff sent it to the entire firm. It was the first time Jeanelle had seen it. She never knew how sad Dad was about missing her wedding. In any event, with all that you have meant to him, I always said to myself I would let you know when he passed. It is done. Thank you for allowing him to leave a little of himself for others who never got the chance to meet or know the Munson family “Superman”." I suspect that you've heard from one or more of my brothers, but, to make sure you've heard, I want you to know my dad has passed. He died in his sleep this AM with a smile on his face and a sword at his side. This world is missing a warrior but Valhala is celebrating. God bless you and thanks for what you did with that marvelous website. I can't tell you how many folks I shared that with. I enjoyed talking with you the other evening. I like your enthusiasm for the documentary and I hope to help in whatever way possible to assist you even though I may not be around to see the final product. My health has been going down hill, darn it. I'll be 89 in May. I hate it when I can't make reunions etc. One of my granddaughters is getting married on the 23rd and over 500 people are attending and I can't make the gathering. Don't get old. When you make another DVD with new additions, please send me a copy so I can keep up with your progress ~ I play it often. Also, I will gladly pay you for your troubles. Let me know if you can use anything like what I have sent, and if so, I will try to muster up another page or two ~ for example a chronology or the continuation of the Cassino story. We even had a car in Company A that was confiscated in Rome. We fixed it up so it looked like a General's car and actually took it with us on the Southern France Invasion. We also found a baby buck sheep in Italy about three days old and it turned out to be such a pet and so darn smart that we took it with us on the invasion. Orville O. 'Billy' Munson was born May 15,1919. At the time of his birth, Orville's folks were farmers living near Crofton, Nebraska. Soon after his birth, when the depression hit the hardest, Orville's folks were forced to leave the farm. With family ties in South Dakota, the Munson family moved to the vicinity of Wessington Springs, and later to Wessington Springs itself, where Orville graduated from High School in 1937. After he finished High School, Orville worked alongside his mother helping her to manage a small cafe business. When the cafe's lease expired, Orville left Wessington Springs to become a member of the United States Civilian Conservation Corps (CCC). He was assigned to camps near Custer, South Dakota, and Newcastle, Wyoming. When his commitment with the Conservation Corps was satisfied, he enrolled in college at the University of Idaho (Moscow, Idaho). As a college freshman, he started every game as a running back on the Vandal's football team. Having a military commitment of one year in the selective service awaiting him, Orville volunteered to enter the service early. He wanted to get his conscription completed so he could get back to college. He entered the selective service to serve one year commencing February 24, 1941. Orville was assigned to the engineer battalion of the 41st Infantry Division stationed at Fort Lewis, Washington. Being exposed to military discipline while serving in the Civilian Conservation Corps helped him to receive recognition for rapid promotion as an enlisted man. As a soldier, once again he took advantage of a sports program and joined the 41st Infantry Division football team. The competition was semi-professional teams from Tacoma, Seattle, Olympia, Spokane and Vancouver, British Columbia. Orville was serving the tenth month of his selective service commitment when the Japanese attacked Pearl Harbor. All inductees in the service, after the Japanese hit Pearl Harbor, were immediately informed their stay in the service would be indefinite. Early in 1942, Orville took advantage of the availability of attending the Engineer Officer Candidate School (OCS) at Fort Belvoir, Virginia. He graduated from OCS in July 1942 and received orders to report to the 48th Engineer Combat Regiment at Camp Gruber, Oklahoma. The Engineer Regiment was renamed the 1108th Engineer Combat Group and the 48th and 235th Engineer Combat Battalions in April 1943. 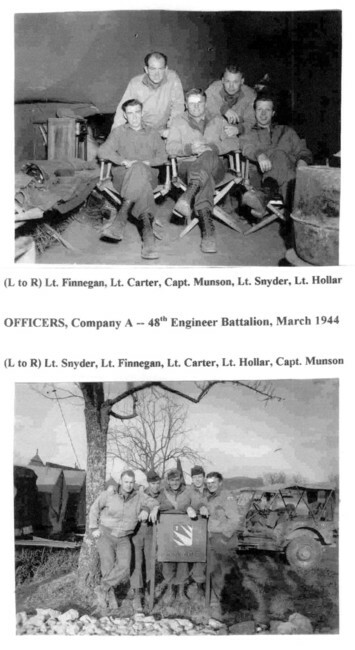 From Camp Gruber, the 48th Engineer Combat Battalion went to North Africa in 1943, went to Italy from Africa, made the invasion of Southern France on D-Day, and finally went on to Germany. The battalion was overseas for seven hundred eighty-nine days. They celebrated the Axis capitulation at Berchtesgaden and Konigssee, Germany, in May 1945. In Italy, members and units of the 48th fought in such famous battles as San Pietro, Mt Maggiorre, Mt La Difensa and Mt Lungo. Fighting as infantry they captured Mt Porchia. From a railroad where all the bridges and culverts were destroyed, they opened up two-way passage of class forty traffic under observed enemy fire that gave Fifth Army an additional highway to the Rapido River and into Cassino. 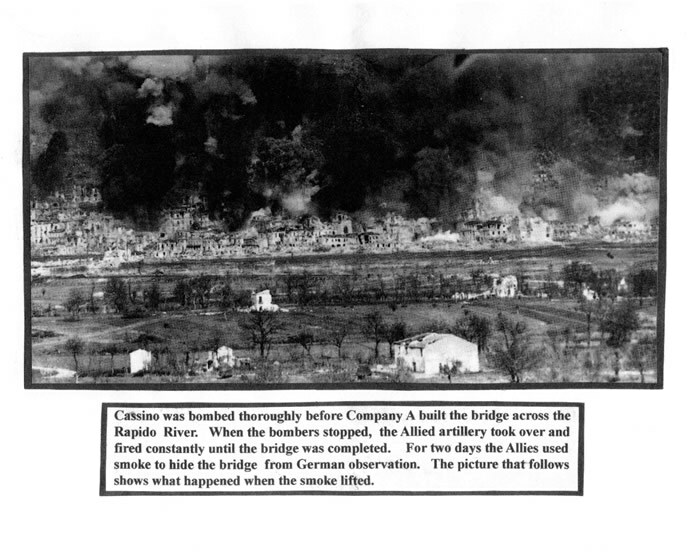 Company 'A' actively supported the failed 36th Infantry Division's crossing of the Rapido River. 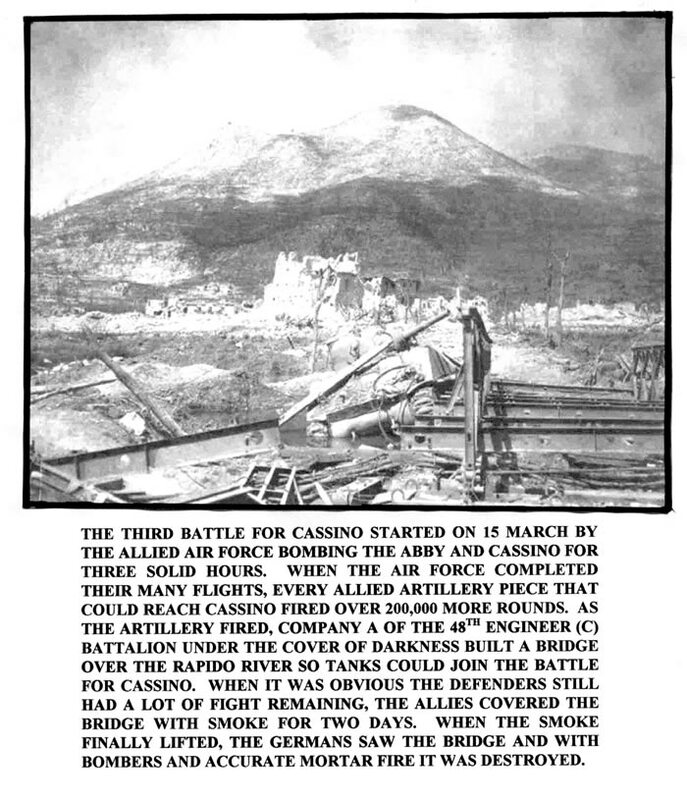 All companies participated closely with American, British, French, Indian, and New Zealanders attempting to capture Cassino and the Abbey. Munson made the first successful daylight engineer reconnaissance of the Rapido River - escaping enemy detection, small arms fire, and hand grenades. Munson returned to the Rapido under the cover of darkness, with members of Company A, and blew the banks of the Rapido so tanks could support the infantry in their direct attack into Cassino. Later, while supporting the New Zealand Corps in its attack to capture Cassino, and covered by a massive Allied artillery attack, Munson returned with his company and built two bailey bridges across the Rapido River (within a stone's throw of Cassino). In the assault that finally broke the back of the Germans defending Cassino and the Abbey, the 48th played an important part on the left flank of Fifth Army in the building of a supply route over mountains that otherwise was impassable. The route was for the attacking French forces and the American 88th Infantry Division. When the breakthrough on the left flank was final, the battalion took a lead roll in opening and maintaining routes for the 85th Infantry Division that fought along the Coast of Italy. The 48th opened new roads over rubble from destroyed homes and businesses through coast towns until the 85th reached Terracina. At Terracina, where the Germans intended to stop the Allied advance, Munson accepted a request from the 85th to widen an old trail that gradually crossed over Mt. Croce; Croce actually hid Terracina and overlooked the seashore. Munson did not know it then, but the trail made wider so tanks could be used was the old Appian Way of many years ago. 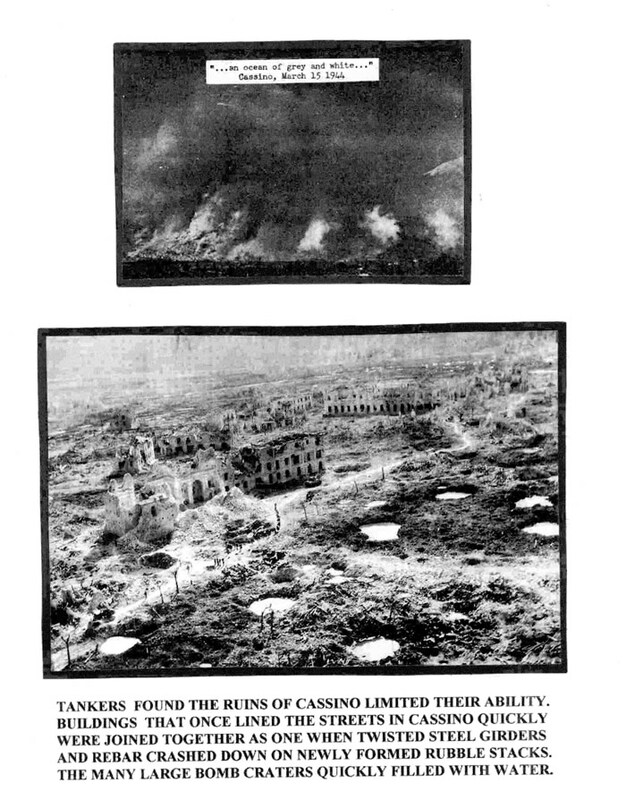 The 85th Infantry, previously stopped cold, with the support of the tanks attacked the back side of Terracina and captured the town with a very minimum of casualties. The capture of Terracina opened the way to the Pontine Marshes and a linkage with the Anzio beachhead. The 48th Engineer Battalion, was the first Army unit to make contact with the beachhead forces. Munson was the Battalion Operations Officers on the day the Americans entered Rome. He and his assistant entered Rome so early in the morning of the liberation that only the orphaned children were out in the streets to welcome the Americans. When the war was over, the Italian government presented Orville Munson with their Italian Military Valor Cross. After the liberation of Rome, Munson's unit became a part of the invasion force that trained and made the invasion of Southern France. Munson's responsibility was to land with a portion of the battalion twenty minutes prior to H-hour on D-Day. The initial main responsibility was to remove or destroy as many obstacles as possible that might impede the landing of the main force. His unit was a part of the invasion force that landed just east of a town called Saint Raphael. After the successful landing of the main force, the 48th served as shore engineers responsible for building enclosures for prisoners of war and for establishing storage depots for needed supplies to support the attack effort. When relieved of their shore engineer responsibilities, the 48th reverted to supporting forward units in the assault of defending forces. The 48* supported the advance mostly by bridge construction so that needed supplies could keep up with the attack units. The help needed became critical in the famous rugged Vosges Mountains where the Germans were making a determined effort to keep American forces out of their homeland. On November 21,1944, as the American Forces broke out of the Vosges mountains, Major Munson was the first American to break rank and enter the town of St Die. The Germans defending St. Die were in the process of torching and deliberately destroying by demolitions the town and its successful businesses. Munson learned after the war that St Die is known in France as "The Godmother of America." Being known as the Godmother of America may have been a reason for the German's determined destruction. Munson's first entrance into St Die was as a soldier making an engineer reconnaissance of the Meurthe River that runs through the town. During that reconnaissance he encountered some Free French hiding in the town. The Free French helped him get the information he needed about the river. With the American infantry attack in a delayed situation, the Major returned to St Die the following day with a platoon of engineers and with extra weapons and ammunition for the Free French. With thirteen Free French already in the town and his platoon of engineers, Major Munson set in motion on November 22,1944, the liberation of St Die, France. Fifty years later, Orville Munson and his wife were invited to return to St Die, France, to celebrate the fiftieth anniversary of the liberation of St Die — "The Godmother of America." When the German Army made their surprise attack in December that materialized into the Battle of the Bulge, the 48th Engineer Combat Battalion was directed to fight as Infantry. Orville at the time was the executive officer of the battalion. The Engineer Battalion was one of three Seventh Army units that remained in Germany after the German attack. The 48th entered combat at the apex of the breakthrough near Ludweiler, German, and they held the position until the front was once again stabilized. When the Americans liberated the German Concentration Camp at Dachau, Germany, the 48th Engineer Bn was supporting the 45th and 42nd Infantry Divisions. Munson entered the camp after the 45th Infantry Division took command of the camp's guard towers. He was accompanied by an enlisted man from the 48th who once was an inmate of the camp. Thinking he might witness the reuniting of the enlisted man with his father, Orville took a camera with him as he entered Dachau. His pictures and special version of what transpired and what he witnessed on the day Dachau was liberated has been put in narrative form. The story includes a short history on the fact Dachau was the mother of all German concentration camps. Munson brought back from Dachau an urn with the ashes of an inmate cremated on December 23, 1940. At the time of the demise of this inhabitant, the Germans were offering inmate cremations to known relatives for a monetary sum. It is Munson's desire that the urn he brought back will someday become a part of some Holocaust Museum. The 48th Engineers ended the war at Berchtesgaden near Konigssee, German. Konigssee is at the base of The Eagles Nest — Hitler's hideout and point of congregation with his staff as the war progressed. For their many exploits the 48th Engineer Battalion received a Fifth Army Meritorious Citation and the United States Presidential Unit Citation. was stationed at 'Camp' Hood, Texas. In December 1949, he was assigned as Engineer Advisor to the Turkish Army. His task was to teach engineer tactics at the Turkish Army Engineer School - Istanbul, Turkey. In September 1950, Turkey showed their support for the military effort in Korea by allocating an Infantry Brigade complete with support troops. Five Americans were chosen to go with the Turks to Korea. Orville Munson was selected to be the Brigade's Engineer Advisor. On 28 November 1950, during the initial Chinese intervention, Orville Munson led the Turkish Brigade into battle until he was so severely wounded he had to be evacuated from the battlefield. For their war effort the Turkish Brigade was presented the Korean Presidential Unit Citation. After Korea, and after six months of rehabilitation from his wound, Munson attended the Army Language School at Presidio of Monterey, California, to study Spanish. Upon graduation he was assigned as the Engineer Advisor to the Cuban Army. He served in Cuba for four years where he was awarded the Combat Engineer Award and the Cuban Order of Military Merit, White Distinction. Munson left Cuba for Fort Benning, Georgia, to be the Battalion Commander of the 10th Engineer Battalion of the famous 3rd Infantry Division. When his tour with the 10th Engineer Battalion was completed he attended the Command and General Staff College at Fort Leavenworth, KS. He then returned to Benning as the Chairman of the Engineer Committee of the Command and General Staff Department - responsible for all engineer instruction at the Infantry School. Munson's assignment after the Infantry School was becoming the Engineer Advisor to the 2nd ROK Army, Taegu, Korea. He served in that capacity for two years before returning stateside, where he was assigned to the U.S. Army Combat Developments Command, Fort Leavenworth, KS. While serving with the Combat Developments Command, Munson was selected for promotion to Colonel (DA Circular 524-51). With approximately twenty years of active service, Munson chose to retire from the military rather than to remain two required years if he accepted the promotion to Colonel. He retired from the US Army in 1964, after serving twenty years. From 1967 to 1971 Munson worked in Thailand as a US citizen. He was with a US company responsible for the upkeep and repair of many Military Installations supporting the Vietnam War. St. Die, The Godmother of America is a human interest story. It brings out colorful factual data from the history of two great nations and ties it to a World War II American soldier who experienced the actual liberation of St. Die, France, in 1944. The author of the story is the American who helped to liberate St. Die. He was born in Crofton, Nebraska, on 15 May 1919. His family moved to South Dakota when he was six months old. In 1941 he enlisted in the army while complying with the compulsory military draft. Due to very fortunate circumstances the author survived two wars (World War II and Korea) as a combat engineer and as an army engineer advisor. While serving in the military he was wounded in combat on four different occasions. He served in Africa, Italy, France, Germany and Korea. 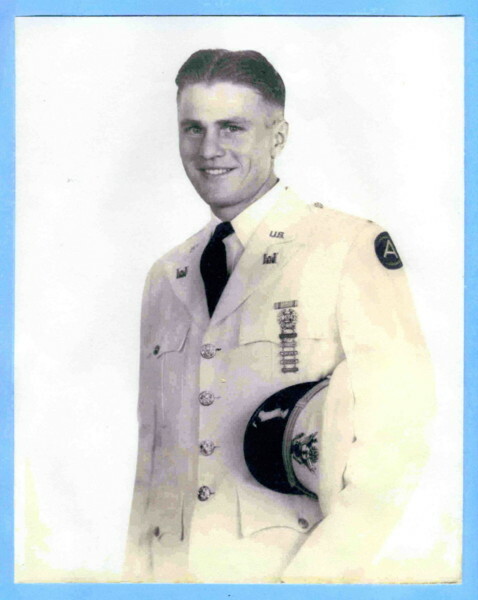 In addition to the purple heart with three oak leaf clusters, he was presented the distinguished service cross, silver star, legion of merit, bronze star for valor and one for military merit, the army commendation medal with oak leaf cluster, nine campaign ribbons and the arrowhead for an invasion on D-Day. He is authorized to wear the United States presidential unit citation, the Korean presidential unit citation, the Italian military valor cross, the Cuban order for military merit, the Republic of Korea army service medal and the United States paratrooper badge. When the citizens of St. Die, France, decided to celebrate fifty years of liberation, the author and his wife were invited to attend the festive occasion. It was during this time frame that the author was encouraged to write about his experience. The baptism of America in the City of St. Die, France, dates back to 25 April 1507. Marion's note: I am dividing the manuscript into several sections for the ease of download. Bill recently received a letter from the French ambassador to the United States, informing him he was appointed a "Chevalier" of the Legion of Honor. I have enclosed Bill's letter to me and the one he received from Washington, DC. Congrats Bill! This article was from Army Engineer Magazine - September/Oct 2012.